The flashing lights, high-pitched bells, and crazy buzzers of land-based and online gaming casinos are distracting, and the can make it tough to figure out which casino games have the best and worst odds. Before logging onto an online casino website or wandering into a land-based casino, first consider what’s most important to you. How important is the experience? And how much is that worth? If having a fun experience ranks high, then you might enjoy learning and trying a new casino game even if the house holds a high edge. Is winning money the priority? Then read on to learn about the various popular games and their odds. Do you want to compete for a large jackpot in an online poker tournament or with progressive slot machines? There’s more to consider than the odds of winning or losing. Anyone who plays a casino game with no understanding of how the game’s details work, relying solely on luck, is going to have a tough time overcoming the odds in any game. Keep in mind that winning at casino games typically favors short-term strategies, so those who continue playing after winning increase their chances of losing their money. Have a personal strategy and reason for playing the games and know the variations of each contest. This is widely considered one of the best casino games to play online and in-person since the odds of winning increase with a player’s knowledge and skill. Payouts of 3:2 can be anticipated if the player wins with a Blackjack. Once you learn a basic strategy, the house edge can be as low as 0.5%. For players relying on educated guesses, the house edge can easily range from 1% to 3%. Do you want the challenge of predicting the probability of what cards will turn up so you don’t bust? Some math is involved. Blackjack cheat sheets are easy to find and use for playing online to guide your decision-making, putting the odds more in your favor. Many players consider Spanish Blackjack to have the best odds of winning of any game in a casino. Learn the specific differences for the best playing strategy. Baccarat is a casino game that’s similar to blackjack. The game can be played with a single deck, six decks, or eight decks. “Punters” can bet on either the Player’s hand or the Banker’s. The bets are placed before the cards are dealt. The Player bet returns 1:1, the Banker pays 0.95:1, and you can bet on a tie which pays 8:1. The house edge in baccarat varies depending on the number of decks that are used, and each bet has a different house edge percentage. The house edge for the Banker is the lowest and runs from 1.01% to 1.0579%. For the Player, the edge can run from 1.28% in a single deck to 1.23% for six and eight decks. Betting on a tie carries a high house edge ranging from 15.7% in a single deck to 14.3% in eight decks. You can just stick to the Banker bet for the best chances of winning. Craps is a popular dice game that looks complicated. There are numerous bets to play. Study the layout of a craps table and select the outside and even money bets for the best chances of winning. Know that the bets in the center of the table greatly favor the house. For bets on the Pass Line, the payout in craps is 1:1. Other payouts differ according to the bet that’s placed. In craps, the house edge varies widely based on what bet you choose. The Pass Line bet edge is almost even while a bet on a 7 has a 20% house edge. Roulette is a casino game that’s as easy to play online – even on a smartphone – as it is in a physical casino. You don’t need to have a high level of concentration like in most card games. American roulette, which has a zero and double zero on the wheel. European roulette, which only has a zero. Thus the European version has better odds for winning than the American version. In roulette the wheel spins and you bet on where the ball is going to land. It sounds easy, but for the best odds playing roulette you need to know where to place your bets. Select black, red, the even numbers, the odd numbers, the low numbers (1-18), or the high numbers (19-36) to place low-risk bets. Outside bets are 1:1. If you bet on a column, the payout is 2:1 but your odds are worse. Betting on a single number, known as a straight-up bet, has the lowest odds, but winning can pay out 35:1. The house edge for a straight-up bet is 37:1. When choosing red or black, high or low numbers, or evens and odds, the house edge in the European version is 2.7% while the American version is 5.6%. This large round wheel is enticing, but the odds to win are relatively low. The player bets the number that the wheel will stop on. The game uses symbols showing $1, $2, $5, $10, and $20, plus jokers and wild cards. The payouts are based on the numbers. A $1 spin that wins is paid out at 1:1. The $10 spin is paid at 10:1, while the joker can bring as much as 45:1. However, the Big Six / Wheel of Fortune is far down the list of recommended casino games because the odds of winning are so poor. The $1 bet is typically an 11% house edge, while aiming for the big payout with a joker gives the casino a 24% house edge. Playing Keno is easy. Winning, of course, is the tough part. Keno is based on a card with 80 numbers. You get to pick up to 20 numbers that you think will be winners (though some casinos may only allow you to pick 10 to 12 numbers). The more of your numbers that are winners, the greater your payout. Like slot machines, newer Keno games now use a random number generator to select the numbers. Don’t count on having a lucky number since the number generator resets. Experienced casino players say playing Keno has odds that are as bad as playing the lottery, securing its prime place in the Worst Casino Games to Play category. Still, it’s a low entry fee, and for those lucky ones who get the numbers, the payout is high. Expect payouts to vary from one casino to another. Expect a 25% house edge or higher, depending on the casino. Slot machines are easy to play, with beginners having as good a chance as experienced players at winning since the results are randomly generated. Slots are popular, and the vast variety of slot machines creates a thrilling casino experience – or tremendous amounts of frustration. Slots are among the casino games that one plays for the experience – not the chance to win money. The higher the bet, the higher the odds of winning. Symbols can payout at specific rates when they’re lined up. Check the pay table of an online slot machine to see how the symbols pay out. Expect a wide range of house edges from a few percent all the way to 11% and higher. Don’t expect to know what the house edge is for the slot machine you choose to play. 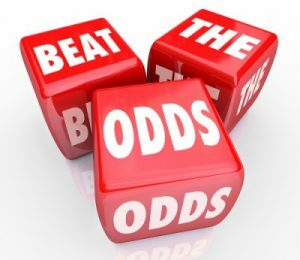 Whether a game is good or bad, side bets have odds that are as bad as any of the bets within the actual games. Worse, side bets can turn a game with good odds to win, like blackjack, into a game with low odds of winning. The house edge in any game is calculated over thousands of hands, rolls of the dice, or spins of the wheel. If you’re winning, collect your money and walk away. If you keep playing, the house edge will average out and you will walk away a loser. Remember, choosing which game to learn and play is a personal preference. Winning is important, but you also may choose a casino game just to enjoy the experience at the world’s best online casinos.